For years I have had a DVD copy of a film called, THE UNNAMABLE II. I had never watched it, because I didn't want to see part 2 of something before I had seen part 1. I assumed I could find the first UNNAMABLE on DVD, but was never able to. It turns out the first film had never been releases on DVD. Well, now the search is over and I can add the first film to my collection thanks to the amazing Stephen Biro and Unearthed Films. 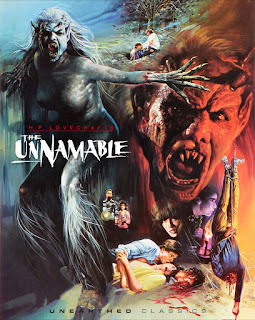 Unearthed Films recently bought the rights to THE UNNAMABLE and have released an amazing DVD and Blu-ray of the film with a newly restored 4K transfer. College students from Miskatonic University who retreat to an early 18th-century mansion for a weekend of lust are stalked by a fatalistic female in this horror film based on a story by H.P. Lovecraft. The demon delights in tearing the limbs off her human victims to carry out a centuries-old family curse. This film was released in 1988, and there is no doubt that it is a product of the 80's. The character's clothing and hair is a dead giveaway. That's how we looked back then, though, so try to look past the laughable clothing choices of some of these characters. The story is simple enough, kids are trying to stay in a house that is inhabited by an ancient creature of some sort. I'm sure it's no surprise to you that the kids meet their demise, one at a time. There are some gruesome kills and some amazing gore in this film, all by practical effects. The monster is not really seen until towards the very end of the film, but when it is revealed, it is well worth the wait. I have no clue what this creature is supposed to be, but it look like it's part goat with it's hooved feet and fur! Unearthed Films has done an amazing job with this release. The picture quality is very clear and I have to comment on the beautiful slip case cover art! I have no idea who did that cover art, but it is truly amazing! Now, I do have to mention one issue I found with this release, and that is the 5.1 DTS-HD Surround Sound has a glitch where the sound effects are doubled. So basically it sounds like an echo after every sound effect. This was super annoying, but switching to the original 2.0 Mono soundtrack fixed the issue and it was fine after doing that. 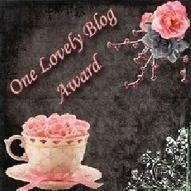 It's a very minor issue, but definitely worthy of a mention. This is a must see in my opinion, especially if you are a fan of H.P. Lovecraft and films inspired by his stories. * 4K Scan with color correction and restoration from the original negative. The plot of the film is simple.....a woman goes looking for her father on an island he was last known to be at. That island is, of course, being ravaged by zombies! The film is known by quite a few other names, such as: ZOMBI 2, ZOMBIE FLESH EATERS, ISLAND OF THE LIVING DEAD, ISLAND OF THE FLESH-EATERS, and WOODOO. 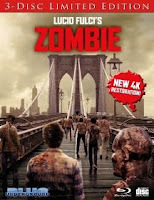 The zombie effects in this film are top notch, and rank among my favorite zombies in film history, especially the worm infested zombie from the original poster and cover art. This is how I imagine a zombie looking if they were real, decayed with worms oozing from the eye sockets! Gross! Along with the great make up and effects is some amazing gore, including the famous splinter in the eyeball scene and multiple neck biting resulting in tons of blood. 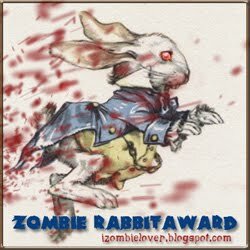 There is also that one scene you might have heard about, where a zombie fights a shark! It really must be seen to be believed, and if you haven't seen it, you are truly missing out! If you have never seen this film, do yourself a favor and watch it asap. 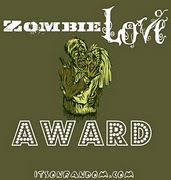 This is one of my favorite zombie films of all time. Even if you have seen it, do yourself a favor and check out this new blu-ray release, as you have never seen it like this before! Bizarre nightmares plague Regan MacNeil (Linda Blair) four years after her possession and exorcism. Has the demon returned? And if so, can the combined faith and knowledge of a Vatican investigator (Richard Burton) and a research specialist (Louise Fletcher) free her from its grasp? Employing production design and special effects that are dizzily exhilarating and a supporting cast (Max von Sydow, Paul Henreid, James Earl Jones) of compelling distinction, director John Boorman draws us into the tangible experience of evil. 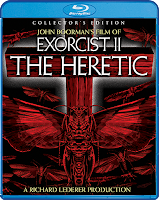 We fly with the demon, feel the African landscape vibrate and get engulfed in the terror of swarming locusts as Exorcist II: The Heretic weaves its fascinating, frightful spell. Going into this, I was really hoping for another classic film. I was hoping for another masterpiece like the original. Well, it's a classic for sure, but unfortunately it's classic for all the wrong reasons. I had heard it called one of the worst films ever, and definitely one of the worst sequels ever. While it is pretty bad, it's not a terrible movie by any means. Now don't get me wrong, it doesn't come close to being anywhere near the caliber of film as the original, but I've seen much worse horror films. The plot is a little weird, and lots of stuff is going on in present day and in flashbacks to the exorcism in Africa, including multiple scenes of locust invasions including a few "first person" shots taken from the locusts point of view. Very strange. The production value looks huge on this film, especially compared to the first, but this just goes to show you that just because a film has a bigger budget that doesn't automatically make it a better film. In terms of presentation, the film looks remarkable. Scream Factory always puts out quality releases and this one is no different. If you're a fan of the original EXORCIST, you will want to give this one a shot. It's got almost a cult classic feel to it now, so it's worth checking out.